Using our unrivalled expertise and your invaluable feedback, we’ve developed the next generation of Flipper algorithms, Joules, designed to save you even more on your energy bills. Here’s what separates our new algorithm from the others. Joules ensures that whenever you're switched, you will not pay more for energy than you should. 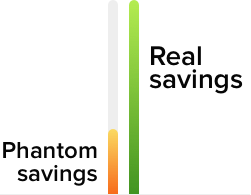 The traditional method of calculating savings isn't always fair for UK energy customers, and can result in heavily inflated “phantom” savings. As we search for better tariffs throughout the year, Joules considers more than just individual savings. Amongst other things, we have to make sure exit fees are properly accounted for. Since Joules is likely to find you better deals while you're within contract, it will factor old exit fees into each flip for you. Joules takes ‘switching times’ into account, prioritising tariffs that you’ll benefit from sooner. The faster you can switch to a cheaper tariff, the less time you spend on your more expensive current deal — and the more you save. Developing Joules wouldn’t have been possible without your invaluable feedback, so from all of us at Flipper, thank you for making this revolutionary technology a reality.